Identification: No tails. Upperside is orangish brown; underside brown. Forewing with outer margin of "frosted" white; irregular postmedian line is white. 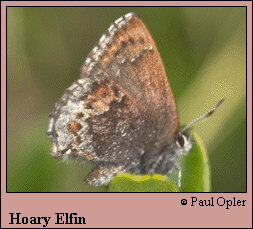 Outer half of hindwing is "frosted" light gray. Life history: Males perch on plants in sunny clearings and low spots to look for females. Eggs are laid singly on leaf buds or flower pedicels. Chrysalids hibernate. Caterpillar hosts: Bearberry (Arctostaphylos uva-ursi) in the heath family (Ericaceae); probably trailing arbutus (Epigaea repens). Adult food: Nectar from flowers including leatherleaf, pyxie, wild strawberry, and willow. Habitat: Open sunny glades in barrens, rocky ridges, dunes, forest edges, adjacent to bogs. Range: Very local distribution. Maine south to New Jersey, south in Appalachians to Virginia; west across Great Lakes states and southern prairie provinces; north to Alaska. Along Pacific Coast to northern California; south in Rocky Mountains to northern New Mexico.